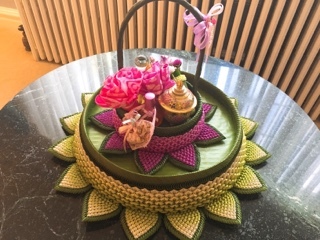 I love all the influences that Thai cuisine integrates: Chinese due to the origins of the early migrants who moved from southwestern China to Thailand bringing chilies and the stir-frying techniques; Portuguese when the Europeans first discovered the country adding seafood and coconuts; and India as traders brought many of the lovely spices and curries we enjoy today. While Thailand’s population is over 65-million strong, according to Toronto’s Thai Trade Centre, there’s only about 11,000 people in Canada. Despite the small Canadian population, restaurants are well represented – especially in the metropolitan areas. 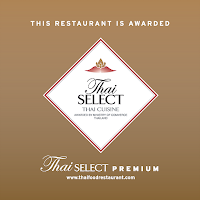 Thailand’s government aims to protect the reputation of their food by instituting the Thai Select program, which endorses the authenticity of a restaurant (in terms of food and hospitality) and encourages those who don’t meet the qualifications to change their techniques. 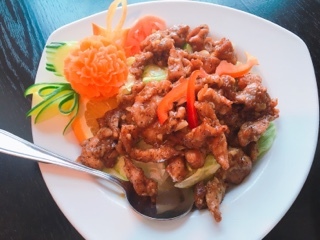 the cooking methods used are similar to what’s done in Thailand. Restaurants awarded the premium status create dishes of a “premium” quality and also takes into account the overall décor and experience. 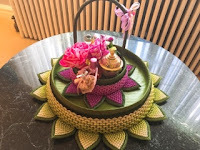 Food isn’t just prepared authentically, it’s presented authentically with intricate decorations (as seen by the beautiful sculpted vegetable carvings). 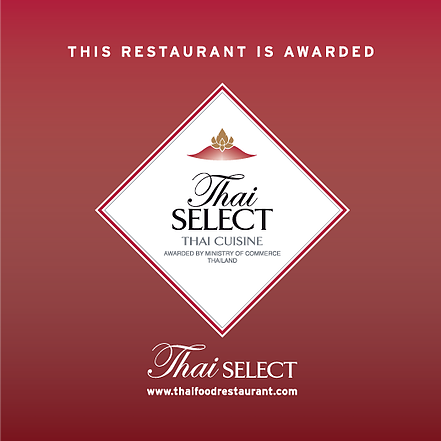 I’ll admit, until being invited to the Thai Trade Centre, I’ve never recognized the Thai Select logo. I’m likely not alone, although 88 restaurants in Canada have already earned the certification, the general public knows little about the prestigious program. 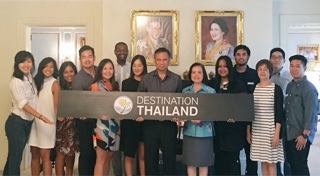 To change this, the Thai Trade Centre enlisted EatNMingle’s help to organize a Taste Thailand Tour. Having been to a number of blogger events, there’s always latecomers who arrive halfway through. Not on this day! The eight of us (so thankful to be selected for such a small group) were so excited that everyone was early, eager to begin our travel from Toronto to Kingston and then Ottawa. Along with members from the Thai Trade Centre, Chef Nuit (Thai Select’s Canadian Ambassador), and Chef Jeff Regular (of Pai restaurant in Toronto), we set off… on time! On board the bus, a breakfast from Patchmon’s Thai Dessert staved off our hunger. 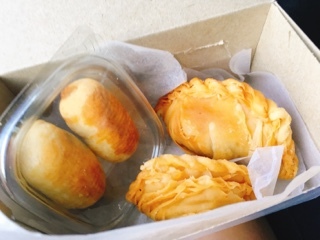 Inside, two flaky pastries (one filled with curried potato and the second encapsulating taro and mushroom) and delicious pineapple cookies. Indeed, it’s a heavy breakfast. Similar to other East Asian cultures, breakfast in Thailand generally tends to be a substantial meal. Items like congee, fried dough and noodles are frequently consumed to give everyone the necessary energy throughout the day. Patchmon’s puffs consisted of delicate crispy layers – the curried potato akin to a lighter samosa, while the taro and mushroom an interesting earthy combination. Given my day was all about eating, I didn’t need that much sustenance, so saved the pineapple cookies for the following day. 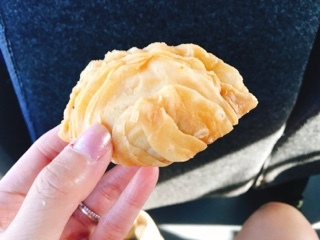 If you’re familiar with the Tawainese pineapple cakes, Patchmon’s cookies has a similar thin soft crust and centre, except less sweet and not as heavy. 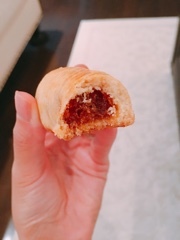 I loved the pineapple slivers you could still see and taste inside the pastry and its chewy sticky consistency, similar to a fig newton. 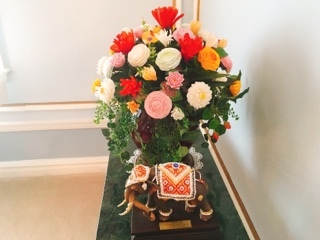 Another treat for the day was visiting the Thailand Ambassador for Canada, His Excellency Mr. Vijavat Isarabhakdi, at his family’s home in Ottawa. A beautiful property, located on a quiet residential street, the pale blue and white decor throughout the house was utterly tranquil. Yet, there were so many interesting photos, beautiful sculptures and intricate flower arrangements that I didn’t know where to look first! All while sipping on the most delicious sweetened coconut water with young coconut pieces. Settling into the dining room, an elegant afternoon tea was laid out. As much as I love scones with Devonshire cream, savoury foods steal my heart, so I’ll opt for the Thai afternoon tea any day. The thoong thong are rice paper sachets filled with a chicken, shrimp and crab mixture and tied together with a spring onion. 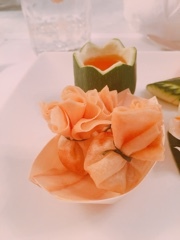 Resembling a filled coin purse, the crisp golden bites were the perfect bite sized hors d’oeuvres. 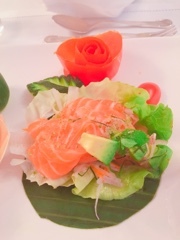 While the tod man gai is traditionally made with fish, His Excellency’s chef switched the protein for chicken instead. Made into a paste with red curry, kaffir lime leaves, and micro fine pieces of green beans, the skewers were almost like meat balls, except pan fried. Despite being dunked into a sweet sauce, the glaze was very light and with the crisp vegetables was rather nice. 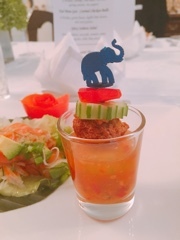 A modern take on Thai cuisine was served - the same spicy salmon salad that won a competition hosted amongst the other Embassy chefs. Salmon is rare in Thailand, but the sashimi style fish dressed with lemongrass, chili, lime juice, mint and avocado was delicious. The sole sweet was a coconut sticky rice topped with Thai custard. 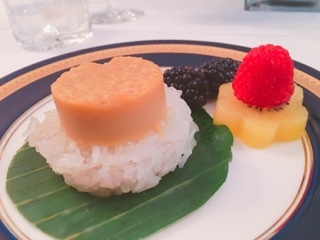 Normally, the warm sweet and salty rice dessert is served with fruits. This rendition took the dessert to the next level by adding a luscious smooth palm sugar and egg custard. You could eat each layer separately and be satisfied, but together the contrasting textures were fantastic. 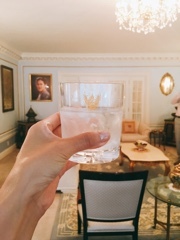 During the tea, we learnt all about the Thai Select program and His Excellency’s love for food. Moreover, he shared that since 2017 will be Canada’s 150th birthday, all Embassies have been invited to host an event at the pavilion in Ottawa. Of course, Thailand will be showcasing their warm culture and delicious food as well. It wouldn’t be a tasting tour without restaurant visits, we sampled so much that our lunch at Thai House Cuisine and dinner at Sukhothai became posts of their own (click the names for the corresponding review). What started out as a group of individuals, many who didn’t know each other, ended as a night of mischievous laughter (thank you to His Excellency for gifting us bottles of pad Thai sauce that made for an interesting KFC popcorn chicken rest stop cooking experience). 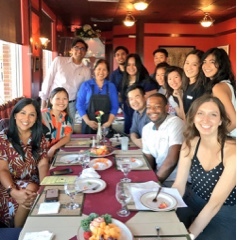 As we proceeded through each meal, we certainly savoured the feasts, but also connected and bonded over the dishes. Seize the day! 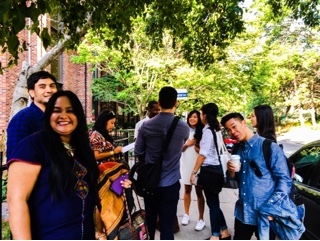 Grab a group of loved ones and do a Taste Thailand Tour across Canada of your own. 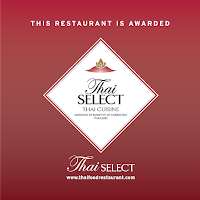 You even have a navigator: just visit Thai Select and let the help guide your journey.